Gunnera is a dramatic plant, one which amazes visitors with small gardens. The huge leaves are strong and inflexible, covered with minute spikes. Wind can shred them, and the edges can get burnt by late frosts, but gardeners shouldn't attempt to touch them - unless well-gloved! Even brushing past them can be quite alarming. I found my original Gunnera plant at the edge of the water race, dug it out, and transplanted it to the edge of the irrigation pond. In its first pond season it was knee high and well behaved, and allowed me to have other plantings close by. Each winter I'd fold the old leaves over to protect the crowns from possible frost damage. The following spring the new leaves would appear, tentatively at first, and push up through their winter protectors. Some seasons ago I took slices off the sides of a crown and planted these over the water race near Rooster Bridge. They're growing strongly. 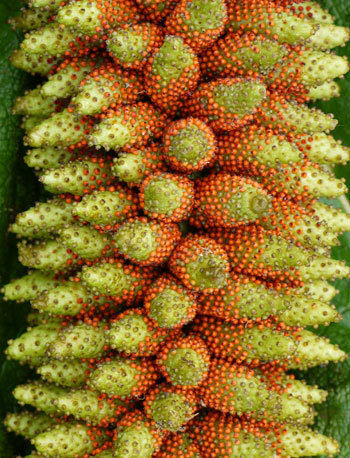 The inside view of a Gunnera plant is best described as grotesque. The flowers, or seed-heads (I'm not sure exactly which they are) are ghastly and stay low in the middle of the plant. The bright orange seeds (produced in late autumn) are extremely colourful, and look rather toxic. The stalks are ferocious with spikes. I love it! On a cautionary note - there is a large Gunnera clump upstream about a kilometer from my garden. Interesting that I have several newly arrived Gunneras which have self seeded on the banks of the water race near Middle Bridge. They are welcome for the moment. 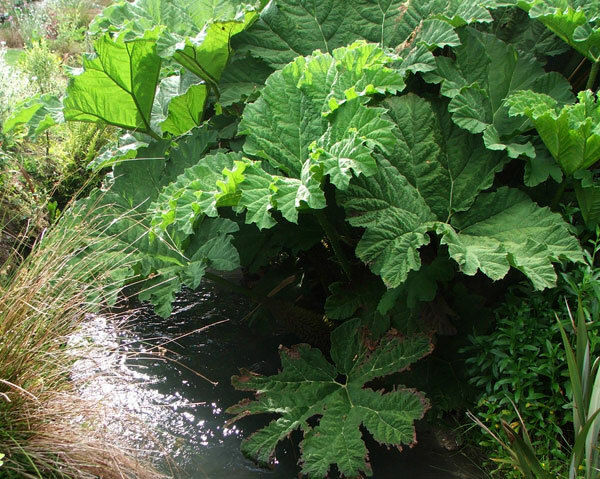 Growing Gunnera along public waterways is probably not a particularly good thing for the Canterbury environment. Oops!